The World Health Organization recently classified processed meat— including bacon— as a carcinogen to humans. Unfortunately, the research does not distinguish between nitrite-free and regular bacon nor does it distinguish between turkey bacon and regular bacon. There is good news plant-based bacon alternatives exist—and they are so delicious! 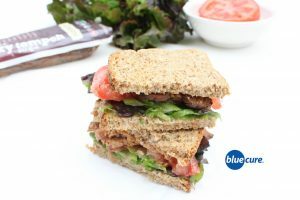 Tempeh bacon is packed with flavor and tastes excellent on a sandwich. Never had tempeh before? Well, it’s a fermented soybean product, a healthful alternative to bacon. Give it a try! Toast the bread. Wash and slice the veggies. On a skillet, warm the meatless- bacon until reached desired texture. If making homemade mayo, blend the ingredients together until smooth. Layer ingredients on the bread. Serve with a side of fresh fruit.